NEW PORT RICHEY, Fla. -- Two people died in an unusual traffic collision on U.S. 19 in New Port Richey Saturday night. About 10:30 p.m. Saturday, a 41-year-old motorcyclist from St. Petersburg was traveling north in the center lane on U.S. 19 approaching Palmetto Road. At the same time a male pedestrian was crossing west to east on U.S. 19 not in a designated crosswalk, the New Port Richey Police Department said. 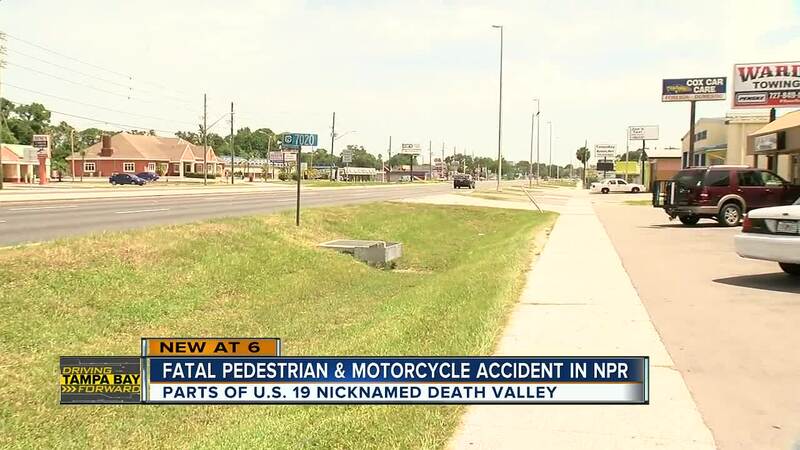 The 2012 Honda motorcycle struck the pedestrian, the police news release said. The pedestrian and motorcyclist were pronounced dead on the scene. Speed did not appear to be a factor, the release said. It is unknown if alcohol or drugs may have contributed to the crash. The victims' names were not released. The pedestrian could not be immediately identified and next of kin had not been notified, the release said. The New Port Police Department is asking anyone with information about the incident to contact Cpl. Brett Schambach at (727) 809-0689.